If your Past Lives are riddled with bad karma or excess stress, you will need to release this stress in a calming, healing ritual. Many of the problems we face in our lives are easily healed by releasing some of the bad karma that has plagued our pasts. To balance out your karma, try committing some good deeds and be giving and open of yourself. This will counteract some of the negativity of your past and let the good karma in. Find a relaxing, comfortable space to begin your healing ritual. Start your meditation by breathing in and out deeply until you are in a calm, relaxed state. Make your desire to escape the oppression of your past lives known once and for all. Declare out loud that you will no longer be a prisoner of the bad karma created in your former lives. Visualize yourself free of bad karmic past lives. Say out loud that you are ready to embrace a new lifestyle that is free of your karmic past lives. You will feel lighter, and over time you will feel braver, stronger, happier and healthier. 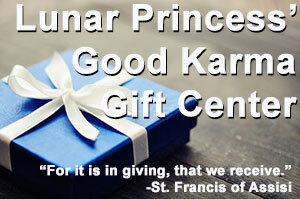 We at ww.secretserendipity.com believe in the power of good karma. Visit us soon on the web and see what we have to offer on this important journey in life. Peace, Love and Music always!